Friday, July 4, 2014 would have been Mama’s 75th birthday. It was a work day for me, and I was grateful to be at work. Otherwise I probably would have just brooded at home and felt sad and lonesome for Mama. At least with work to keep me occupied, I was able to have a bit of a distraction and some productivity. The workplace was quieter than usual since most of the building had the holiday off, and that extra quiet atmosphere was a relief. I couldn’t help thinking back to the countless birthdays of Mama’s that she and Aunt Ruby had spent canning green beans at Aunt Ruby’s house. Sometimes there were firecrackers and sparklers once dusk began to settle. I can still hear the crunching of rock salt in Uncle John’s old-fashioned ice cream freezer, and feel the anticipation of the frosty, creamy deliciousness it would eventually render. Such sweet memories of simpler, younger days brought me a homesick feeling for the times and places of my yesteryears. I decided to leave the building for lunch. The day was uncharacteristically balmy, with low humidity and milder-than-typical temperatures for July in East Tennessee. As I strode toward my car, a feather on the ground caught my eye! Since I collect them, I was thrilled to find one on this special day, and I looked skyward and said “Thank you!” to God for this wonderful blessing. 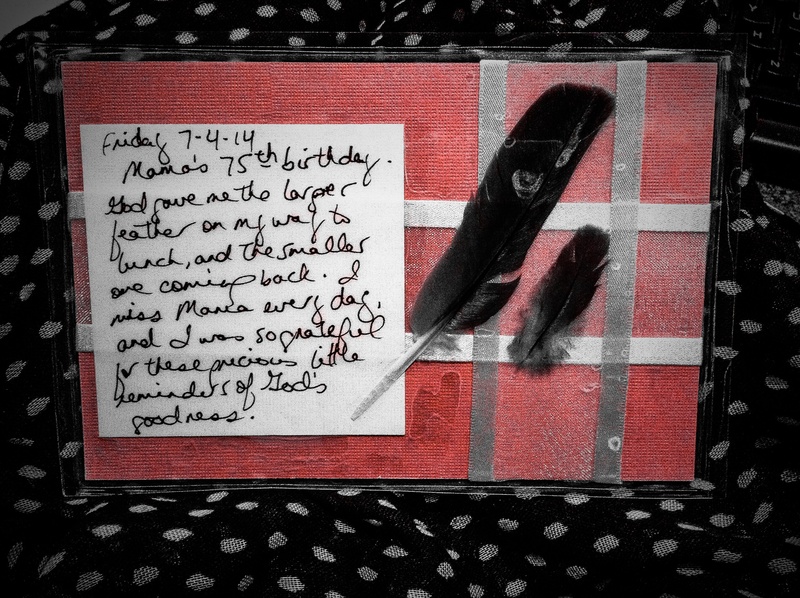 I talked to Dad on the phone last night and told him about my two feather day, reminding him that I collect feathers and babbling on about how special it was to find these on Mama’s birthday. He asked why I started collecting feathers in the first place, and I explained that, while it may seem childish, I see feathers and like to imagine they dropped from the wing of some guardian angel God placed in my path to watch over me. I half expected him to laugh at the silliness of such a notion, but, to my surprise, he said that it was a good outlook to have. Maybe I didn’t give him enough credit. Who is to say where a person can or cannot find God’s presence? I think one can find Him anywhere, in anything. The key to finding Him is just to look with open eyes and an open spirit. Lord, thank You for the reminders all around me that You are indeed looking after me with watchful, loving care. Thank You for sending feathers on Mama’s milestone birthday, and for releasing her from the ailing body that trapped her for so long, for freeing her spirit to soar in Heaven with You and so many of our loved ones.